German “Tiger” heavy tanks from the 101st SS Heavy Tank Battalion moved down the road №316 to Morgny (Normandy, France), 7 June 1944. In the 101st SS Heavy Tank Battalion, served as the legendary German tank ace Michael Wittmann. Michael Wittmann in “Tiger” tank from the 101st SS Heavy Tank Battalion in June 13, 1944 may be glorified in the famous battle at Villers-Bocage, destroyed a lot of tanks and other military equipment of the British. 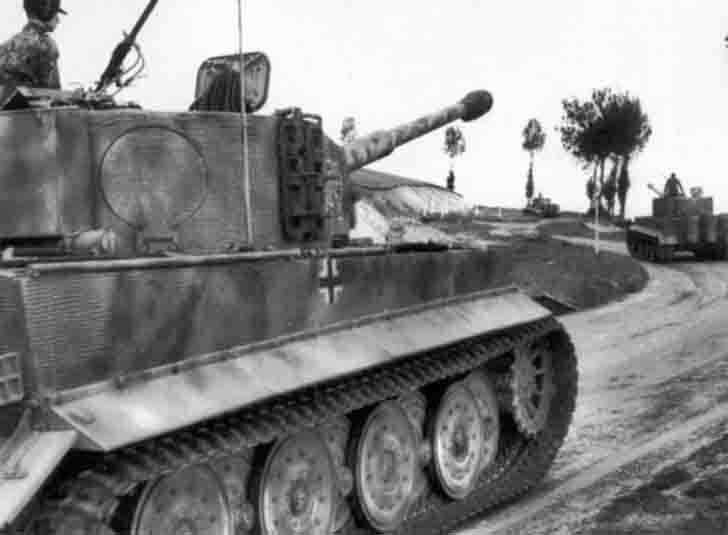 In the foreground, the “Tiger” heavy tank №224, commander of the SS Unterscharführer Ewald Mölly.